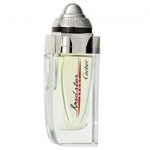 Cartier Roadster Sport For Men is a fresh, modern and casual fragrance for men; a symbol of freedom and sensation. The aromatic citrus-amber scent strikes a unique balance that donates the immediate impression of elegance, freedom and casual chic. Cartier Roadster Sport For Men is a fresh fragrance of absolute masculinity. It begins with a fresh explosion of zests, such as bergamot, lime and tangerine, followed by the soft freshness of aromatic sage and rosemary and is enhanced by the power and sensuality of black pepper. Finally, this unique aftershave ends with patchouli and gaiac wood are blended together for a manly and sensual presence. A “casual-chic” version of the Roadster fragrance with refreshing mint and a brilliant explosion of citrus fruits.